The curtains formally came down on the late Nobel Laureate, environmentalist and human rights activist this morning, in a somewhat watered down state funeral, at the Freedom Corner in Nairobi’s Uhuru Park. President Mwai Kibaki and Prime Minister Raila Odinga led a host of dignitaries in paying tribute to the global icon. 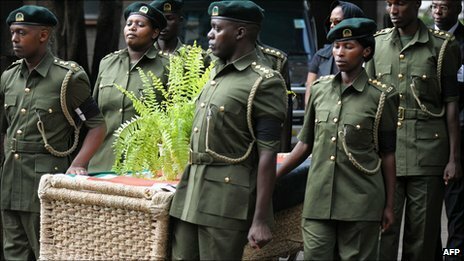 Wangari’s final journey ended at the Kariokor crematorium. Kenyans of all walks of life turned up Saturday to pay their last respects to befallen Nobel laureate and environmentalist Wangari Maathai. Massive crowds line up along the procession route to bid farewell to the Kenya’s heroine who was accorded a state funeral and also catch a glimpse of the bamboo-framed casket. The coffin made out of water hyacinth and papyrus reeds and draped in the Kenyan flag was wheeled out of Lee Funeral Home and into a hearse to take the fallen heroine on her final journey. The coffin, specially made by three artisans from the Kisumu Innovation Centre Kenya, is in fulfillment of Prof Maathai’s final wish not to be buried in a wooden coffin. The procession drove down through Valley Road, past Serena Hotel and into the Freedom Corner in Uhuru Park where an Inter-denominational mass funeral service was held and official rites made in her honour. The environmentalist was accorded a send off befitting her iconic stature with a moment of silence being observed as bells rang at All Saints Catherdaral. After playing of the National Anthem by the Kenya Prisons Band and opening prayers, Maathai family and the Green Belt Movement members proceeded to plant one Olea Africana tree. This is one of the highly regarded indigenous trees known as Mutamaiyu by the Kikuyu, Kumunyubuti by the Luhya and Kang’o by the Luo. It is a very versatile tree, able to tolerate a wide variety of environments. Traffic was disrupted in all roads leading to the Kenyatta Avenue/ Uhuru highway roundabout after most of them were close by police to give way for the procession. Dignitaries and government officials turned up to show their respect. President Mwai Kibaki, Prime Minister Raila Odinga, Vice President Kalonzo Musyoka and Deputy Prime Minister Uhuru Kenyatta were among government leaders present. Envoys from across the globe including former Habitat boss Anna Tibaijuka representing Tanzania’s President Kakaya Kikwete were present. The leaders described Maathai as a great visionary who beat odds in her relentless effort to save the environment. Tibaijuka, said the Tanzanian nation is united with Kenyans in sending off African’s outstanding daughter. United Nations secretary general Ban Ki-moon, through a representative, said Prof Maathai was globally recognised as champion of human rights and women empowerment. The public ceremony ended shortly before midday after which the cortege headed for a private cremation ceremony attended only by family members in Kariokor as per wishes. Maathai’s remains will be interred at Nairobi University, Kabete campus at her Wangare Mathai institute for peace and environmental studies. Wangari Maathai died in Nairobi two weeks ago while undergoing cancer treatment. She was 71. She won the Nobel Peace Prize in 2004 for promoting conservation, women’s rights and transparent government – the first African woman to get the award. Maathai was an elected Member of Parliament and served as an Assistant Minister for Environment and Natural Resources in President Mwai Kibaki’s government between January 2003 and November 2005. Unlike Black Africa where foreigners especially Whites are treated like royals and offered first class hospitality, Europe and other western countries view Africans as unwanted entities, treat them with contempt and subject them to bigotry. Many Africans make their way to the West in search of economic prosperity, better social life, and “unrivalled” happiness, but what they usually find is financial bankruptcy, solitude, and/or depression. It is only when they set foot on the shores of the illusive Garden of Eden that they discover that the West is not as welcoming to Black African migrants as they had perceived. Politicians and the western media are now inciting xenophobia and racism, and creating an atmosphere of fear by blaming almost every misfortune that befalls them on Black African immigrants. The West’s economic demise such as high rate of unemployment among indigenous people, shortage of housing facilities, and the bankruptcy hitting banks are usually blamed on poor and defenceless Black immigrants. Poor and jobless lower class Whites blame their misfortune on the influx of migrants. Homeless Whites identify Black African immigrants as the source of their homelessness. Old and conservative Whites point accusing fingers at underclass Black Africans for rising crime rates in their neighbourhoods and countries. Mayors and local commuters blame over-crowding in urban centres on Black migrants. Incurable diseases such as HIV/AIDS, in the eyes of the Whiteman have been transported to western countries by the man from the “Dark Continent”. Consequently, the African immigrant has become an object of mockery and serious attacks in western countries. Umberto Bossi, the leader of the ‘Lega Nord per l’Indipendenza della Padania’ (North League for the Independence of Padania) political party in Italy, and a top member of Mr Silvio Berlusconi’s fourth cabinet, suggested in 2003 that fire be opened on illegal African immigrants who cross the Mediterranean, to prevent them from landing on Italian shores, referring to them as ‘bingo-bongos’ (jungle people or Tarzans). The Prime Minister, Silvio Berlusconi, is also quoted as saying that the streets of Milan reminded him of an African city – implying that Milan streets are invaded by Africans, dirty, stinky and chaotic. There are frequent reports of vicious attacks on Black African immigrants in Italy, Germany, Portugal, France, UK and other European countries. In Italy and France for instance, this kind of propaganda by politicians, the media and some locals, has resulted in titanic hostility towards Black African immigrants and serious racial violence. Attacks and at times killings have continued intermittently and incessantly. In January 2010 for instance, a group of anti-Black immigrants opened fire on two African migrant workers from a moving vehicle in the southern part of Italy. Many illegal immigrants suffer serious abuse, and others become victims of robbery and all sorts of attacks day in day out; but pathetically, they are unable to report them to the police for fear of ending up in detention centres and being deported. Numerous reports are heard of Black African immigrants absurdly taking to their heels apparently to avoid possible deportation, after being hit by drunk or careless drivers. Italian immigration laws currently allow refugees without genuine residential permits to be locked up for half a year. How could African migrants have their peace of mind and comfort if they live in countries like the UK or Germany where persistent random identification exercises are carried out on immigrants, or Italy where the current law legalizes the introduction of ‘vigilantes’ (civilian militias) to supplement the systematic use of soldiers to patrol town and city centres and to intimidate foreigners. In the UK, a Black African is about ten times more likely to be stopped and searched than his White counterpart. The immense contribution being made by immigrants to these western economies is hardly mentioned. Tabloids such as the ‘Sun’ in the UK are always quick to magnify the slightest of unpleasant incidents involving a foreigner, especially a Black African immigrant, as they did to the Big Brother celebrity, Makosi Musambasi which cost her the victory that she clearly deserved in the 2005 Big Brother UK contest. The young and talented Zimbabwean singer Gamu Nhegu was controversially eliminated from the 2010 edition of the ITV1 singing talent show, X Factor clearly due to her mum’s immigration status, even though she was considered by many as the favourite to win the contest. The African immigrant in the West has rights only in theory and surely not in practice. In the UK, racist comments or acts are not openly expressed due to the quite strict laws against racism and the use of racist language. The inability of indigenous Brits to openly express their true feelings and thoughts about African immigrants has thus turned many into hypocrites – saying one thing about the Black African in public but thinking the other – calling him mate, buddy, love, darling, and gorgeous in the open, but describing him to a fellow White in secret as a detestable sub-human species, unlovable, stinky, and chimp-like entity. They try to ‘… look like the innocent flower, / But … the serpent under it’, as Shakespeare puts it. Contrary to the UK, Italy is today fast growing into a racist land where there seems to be no serious stigma attached to the use of racist language. Many say anything they want against Black Africans and go scot-free because there are no concrete laws prohibiting the use of racist language against them. A Black African jumps on to a public bus in Rome, and the seat beside him remains unoccupied until he gets off even though the bus may be full with many passengers standing and being tossed left and right. It is only when the Black African puts his handbag on the “rejected” seat beside him that White folks realize the need to sit as well. They come for the seat not because they are comfortable sitting close to him, but because they want to express their disgust and anger for securing a seat for an inanimate object while human beings, in fact the “owners” of the bus are standing. One may question why I persistently employ the term Black Africa and not just Africa in describing the plight of African immigrants in the West. The indisputable reason is that the fate of the dark-skinned African and that of the light-skinned African are never the same in western countries. The latter is viewed as our kind while the former is seen as the other kind. In Britain for instance, White South Africans are treated with respect and dignity even if they are illegal while the Black African from the same country is disrespected, constantly humiliated and falls into the ready trap of an illicit migrant. They have the same passports but different treatments in the developed world because of the difference in skin colour. People in Africa are deceived into believing that the West is the haven for prosperity, an idea drummed into them from an early age by a continent reliant on remittances from overseas workers. Borrowing Thomas Hobbes’ words, I describe the life of many if not most African immigrants in the industrialized world simply as ‘solitary, poor, nasty, brutish and short’. It is this terrible treatment of Africans that has prompted Pope Benedict XVI to pronounce that an immigrant is a human being, different in place of origin, in colour, in their culture and tradition, but a person with rights and responsibilities, and should be respected.